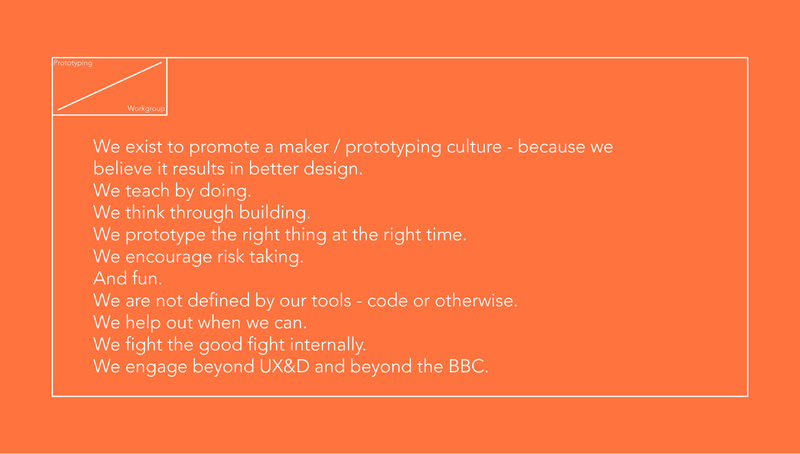 The Prototyping Workgroup was a small working group that I founded in order to create a better ‘Build to Think’ prototyping culture at the BBC. Through informal workshops and show-and-tells, the working group evangelised prototyping culture, connecting makers across the business while offering support for those about to embark on creating a prototype. Believing in the joy of making and getting your hands dirty, we in the group went beyond just screen-based prototypes and also held workshops in physical prototyping, design games and co-creation and experimented with different testing methodologies.